High fibre. Low in sugar and salt. 100% wholegrain wheat. Suitable for vegetarians. The Nation's Favourite Cereal? ? The number 1 cereal brand in the UK and ROI based on the last 52 weeks of retail sales value from Nielsen up to 03.12.2016 Want to enjoy a healthy start? 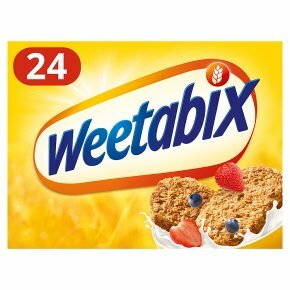 Weetabix is packed with 100% wholegrain goodness* and is high in fibre. Top it with natural yoghurt, a drizzle of honey and some fresh strawberries, which are an excellent source of vitamin C. There's no better way to start your day! Have you had yours? *Wheat Bran fibre contributes to an acceleration of intestinal transit as part of a healthy diet and lifestyle. The beneficial effect is obtained with a daily intake of 20g of wheat bran fibre.